Loretta Sanchez won election to the U.S. House of Representatives—her first political office—by toppling a polarizing, longtime incumbent. During her 20-year tenure in the House, Sanchez established herself as an advocate for women in the military and specialized in national security policy, rising to become one of the most senior Democrats on two influential committees—Armed Services and Homeland Security. In 2003, she made history when her sister, Linda, won election to the House, making the pair the first sisters to serve in Congress. Sanchez had started out as a registered Republican and fiscal conservative, but she broke with the GOP in 1992, believing the party had marginalized immigrants and women. Her first attempt at political office was a 1994 campaign as a Democrat for a seat on the Anaheim city council; Sanchez finished eighth out of 16 contenders. 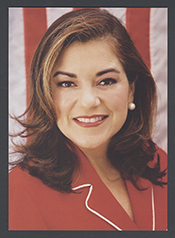 During the primary campaign, Sanchez touted her business credentials, particularly her effort to secure funding from national companies to establish programs between local grade schools and state colleges in Orange County.6 Despite her lack of political experience, she defeated three male contenders in the Democratic primary with a plurality of 35 percent of the vote. When Congresswoman Sanchez took her seat in the House at the opening of the 105th Congress (1997–1999), she received assignments on the Education and Workforce Committee and the National Security Committee (later renamed Armed Services). She served on Education and Workforce through the conclusion of the 108th Congress (2003–2005), but remained on Armed Services for her entire career. Additionally, in the 109th Congress (2005–2007), she won a seat on the newly created Homeland Security Committee. She remained there for the duration of her time in the House, rising to the chairmanship of the Homeland Security Subcommittee on Border, Maritime, and Global Counterterrorism when Democrats won the House majority in the 2006 elections. She held the gavel for the 110th and 111th Congresses (2007–2011). Sanchez often emphasized her fiscally conservative roots. She joined the Democratic Blue Dog Caucus, pushed for a major overhaul of the Internal Revenue Service, and supported pay-as-you-go requirements and other budget deficit reductions. She was also one of roughly 60 Democrats who opposed the taxpayer funded TARP bank bailout during the economic meltdown in the late summer of 2008. Sanchez retired from the House at the conclusion of the 114th Congress in early 2017. 1Politics in America, 2002 (Washington, DC: Congressional Quarterly Inc., 2001): 152–153. 2Gregg Zoroya, “The Freshman,” 13 July 1997, Los Angeles Times Magazine: 8. 3Jennifer Mena, “Sister Act’s Ascent to Congress Has Roots in No-Nonsense Upbringing,” 23 June 2003, Los Angeles Times: B1. 4Karin Tanabe, “Loretta Sanchez Tying the Knot,” 14 July 2011, Politico, http://www.politico.com/blogs/click/2011/07/loretta-sanchez-tying-the-knot-037459 (accessed 28 November 2016); Martin Wisckol, “Rep. Loretta Sanchez to Wed Saturday,” 15 July 2011, Orange County Register, http://www.ocregister.com/totalbuzz/strong-468797-einwechter-sanchez.html (accessed 28 November 2016). 5Almanac of American Politics, 2002 (Washington, DC: National Journal Group Inc., 2001): 277. 6“Loretta Sanchez,” New Members of Congress Almanac for the 105th Congress (Washington, DC: Almanac Publishing Inc., 1996): 32. 7Almanac of American Politics, 2000 (Washington, DC: National Journal Group Inc., 1999): 297. 8Peter M. Warren and Nancy Cleeland, “Challenger Sanchez Has Dornan Out for the Count,” 13 November 1996, Los Angeles Times: A1; Politics in America, 2000: 297; Office of the Clerk, U.S. House of Representatives, “Election Statistics, 1920 to Present,” http://history.house.gov/Institution/Election-Statistics/Election-Statistics/. 9Warren and Cleeland, “Challenger Sanchez Has Dornan Out for the Count”; Gebe Martinez, “Swearing in Won’t End Sanchez Saga,” 7 January 1997, Los Angeles Times: A1. 10“House Formally Dismisses Dornan Challenge to Sanchez,”13 February 1998, Washington Post: A6; Jodi Wilogren, “House Gives Sanchez Reason for Celebration: Task Force Drops Inquiry, Leaving Her With Incumbency, National Celebrity and Fund-Raising Prowess,” 5 February 1998, Los Angeles Times: A1. 12Almanac of American Politics, 2012 (Chicago: The University of Chicago Press, 2011): 263. 13Phil Willon, “8 Things to Know about Senate Hopeful Loretta Sanchez’s 20-Year Political Career,” 7 July 2016, Los Angeles Times: n.p. ; Politics in America, 2004 (Washington, DC: Congressional Quarterly Inc., 2003). 14Congressional Record, House, 109th Cong., 1st sess. (9 February 2005): E199. 15Phil Willon, “8 Things to Know about Senate Hopeful Loretta Sanchez’s 20-Year Political Career,” 7 July 2016, Los Angeles Times: n.p. 16Politics in America, 2012 (CQ-Roll Call Inc., 2011): 155. 17Almanac of American Politics, 2016 (Columbia Books & Information Services, 2015): 300–301. 18Congressional Record, House, 111th Cong., 1st sess. (21 October 2009): 25264. 19Almanac of American Politics, 2016: 300–301. 20Almanac of American Politics, 2016: 301; Almanac of American Politics, 2004 (Washington, DC: National Journal Group, 2003): 284. 21Politics in America, 2012 (Washington, DC: CQ-Roll Call, Inc., 2011): 154. 22Amie Parnes, “Rep. Sanchez Unveils New Card?,” 13 December 2010, Politico, http://www.politico.com/click/stories/1012/rep_sanchez_unveils_new_card.html (accessed 29 November 2016); Kim Geiger, “Beloved Cat Still a Part of Loretta Sanchez’s Whacky Holiday Card,” 16 December 2011, Los Angeles Times, http://articles.latimes.com/2011/dec/16/news/la-pn-loretta-sanchez-gretzky-20111215 (accessed 29 November 2016). 23Quotation in Mena, “Sister Act’s Ascent to Congress Has Roots in No-Nonsense Upbringing.” See also “Richard Simon, “Loretta and Linda Sanchez Star in House’s First Sister Act,” 8 January 2003, Los Angeles Times: A8; Dena Bunis, “Congress Gets Its First Sister Act: Orange County Rep. Loretta Sanchez and Sibling Linda Gain Historic Win for Hispanics and Women,” 6 November 2002, Orange County Register: B1; Roxanne Roberts, “House Mates: Loretta and Linda Sanchez Are Congress’s First Sister Act. They Work Well Together. The Question Is, Can They Live Together?,” 12 December 2002, Washington Post: C1. 24Almanac of American Politics, 2016: 301. 25Christopher Cadelago, “Sanchez to Challenge Harris for Senate Seat; Says ‘Insiders’ Won’t Decide Race,” 14 May 2015, Sacramento Bee, http://www.sacbee.com/news/politics-government/capitol-alert/article21004338.html (accessed 29 November 2016); Michael Finnegan, “Rep. Loretta Sanchez Enters Race for Barbara Boxer’s Senate Seat,” 14 May 2015, Los Angeles Times, http://www.latimes.com/local/political/la-me-pc-loretta-sanchez-senate-campaign-20150414-story.html (accessed 29 November 2016). 26John Myers, “Two Democrats Will Face Off for California’s U.S. Senate Seat, Marking First Time a Republican Will Note Be in Contention,” 8 June 2016, Los Angeles Times, http://www.latimes.com/politics/la-pol-ca-senate-primary-election-20160607-snap-story.html (accessed 29 November 2016). 27Vanessa Williams, “Kamala Harris Continues to Hold Solid Lead over Loretta Sanchez in California Senate Race,” 21 September 2016, Washington Post: n.p. ; California Secretary of State, U.S. Senate Statewide Results, accessed 29 November 2016, http://vote.sos.ca.gov/returns/us-senate/. Papers: The papers of former Congresswoman Loretta Sanchez have not yet been processed. "Loretta Sanchez" in Hispanic Americans in Congress, 1822-2012. Prepared under the direction of the Committee on House Administration by the Office of the Historian and the Office of the Clerk, U.S. House of Representatives. Washington: Government Printing Office, 2013. "Loretta Sanchez" in Women in Congress, 1917-2006. Prepared under the direction of the Committee on House Administration by the Office of History & Preservation, U. S. House of Representatives. Washington: Government Printing Office, 2006. Sánchez, Linda and Loretta, with Richard Buskin. Dream in Color: How the Sánchez Sisters Are Making History in Congress. New York: Grand Central Publishing, 2008.